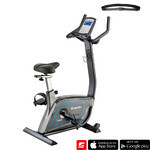 Professional cardio machine intended for users with reduced mobility, adjustable seat position, practical handles, adjustable back support, ergonomic padding. 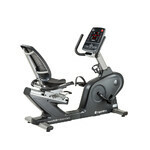 The Recumbent TechnoGym Excite Recline Advanced LED is a professional cardio machine which allows you to exercise your body in a backbend position. The large space between the seat and the pedals makes it easy even for users with reduced mobility or overweight users to get on/off the recumbent. All you have to do when getting on/off the machine is step over 6.5cm/2.5” frame pipes. If necessary, you can hold onto the handle underneath the display or the handles beside the seat. Once you are seated, it is easy to find a comfortable position. The back support can be adjusted to 4 positions, thus allowing for a comfortable workout. Both the seat and the back support are padded with a specially designed material. 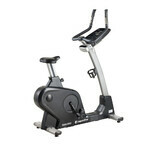 The recumbent’s wider pedals provide greater stability and support. The straps can be easily adjusted by simply tightening and releasing the buckle. The 10 degree pedal incline toward the ground makes it easier to slide the feet inside the pedals from a seated position. The Recumbent TechnoGym Excite Recline Advanced LED features a high-quality LED display on which you can follow all the important information. Using the buttons that are built into the handles beside the seat, you can easily adjust the resistance. Also built into the handles are heart rate sensors. Moreover, this machine is also compatible with a chest strap. The Recumbent TechnoGym Excite Recline Advanced LED features the following functions: 6 preset programs, 9 user programs and the CPR program which automatically adjusts resistance to help you stay in the required heart rate zone. 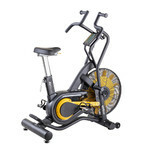 With its 25 resistance modes, adjustable seat, secured pedals and adjustable back support, the Recumbent TechnoGym Excite Recline Advanced LED provides a comfortable cardio workout.